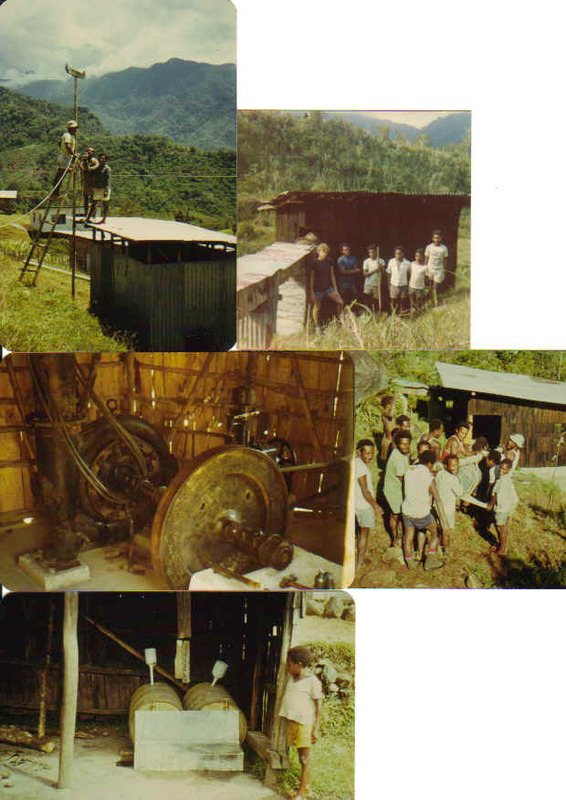 These pictures are from the period when I was deputy-headteacher at St Peter's Extension School, Kerema & Araimiri, PNG, and then responsible for wiring up the Bema micro-hydro electric scheme. Many of the pictures illustrate references in published papers from this era. These have hyperlinks through to index points within this page. Captions are given at the top of each picture to permit ease of scrolling down. Most pictures are in groups of about three to limit file loading times. 1. Sketch map of the Gulf Province. 1. Moveave and Orokolo boys swimming on Kerema beach. 2. Catholic Church Kerema, where St Peter's Extention School was first situated viewed from school canoe. 3. Canoe park below school. 4. Mangrove swamps and mountains to NW of Kerema - Kearu merging into Kamea territory. 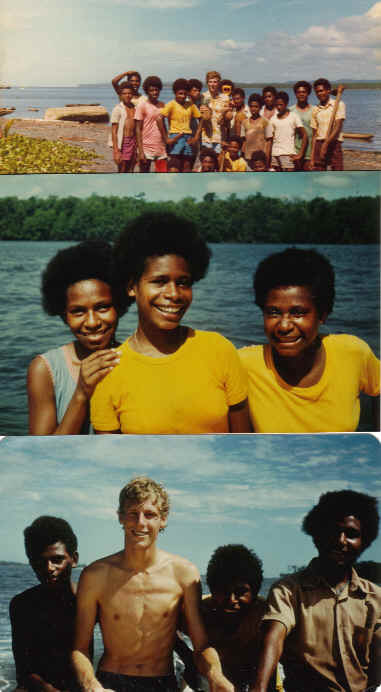 1-3, With schoolkids around Kerema Bay (me sans beard and before the malnutrition and malaria set in!). 1. Missionaries of Charity (Mother Theresa) sisters - left to right either Sister Maurice or Joseph (I think), Sr. Leah from Australia, and Sr. Magdelene, the Mother Superior, from India. They'd jump out of bed every morning at 4.30 am, and during my first year I was sleeping right underneath them. They were hopelessly impractical about some things, but deeply devout and loving. 2. The late Archbishop Virgil Patrick Copas of Australiawho founded and was head of St Peter's Extension School. Previously the Archbishop of all PNG, he was theologically conservative (against women priests, etc. ), but had an immense compassion and total dedication to the poor. It was difficult to walk through his "Archepiscopal Palace" at night because the floor would be covered with schoolkids, homeless people and travelers sleeping on it. I would sit with him and drink tea mostly in silence in afternoons after teaching, and his presence had a big influence on me. Through his pastoral insight, he taught me to understand the despair that led young men (such as those the school was established to help) to crime and violence. Once, when building materials were stolen, he said to me, "I hope their need is greater than ours was." 3-4 - The "Bishop's" Catholic Church at Kerema showing Christian motifs set in traditional mythological context. Once I'd got over the surprise having come from Presbyterian Lewis, I found it was great being a VSO volunteer posted to a Catholic Mission. You could opt in to what you wanted, without feeling under pressure to go along with the whole show. Many of the priests and nuns were phenomenal people, and in our area they had a strong ecumenical spirit. 1. 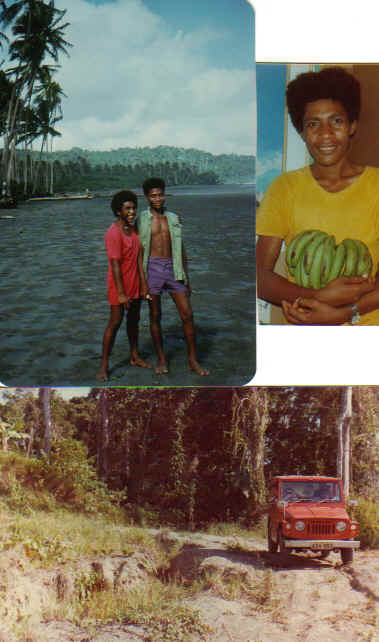 Looking towards the Bluff: Wesley and Davis - source of some of my Milne Bay Province material. 2. Noel "Bush Baga" Gaguna, the Bishop's driver and a source of some of the Rigo (Central Province) material. 3. The "highway" over the Bluff. 1 & 2 - Elema totemistic dancing, Independence/Provincial Government celebration on Kerema Oval. 3. Kamea ("Kukukuku") dancers at the same event. 1 & 2 - Catholic Church Araimiri, West of Kerema, to where St Peter's Extension School moved in 1979 - see Maea au Huhaharula paper. 3. One of my electricity classes - how not to wire up a light bulb. Most people die not from the electric shock, but from it causing them to fall off the ladder! 1. Me with Hearu Mukari of Akapiru and his wife. Hearo is dressed in his "sorcery outfit". 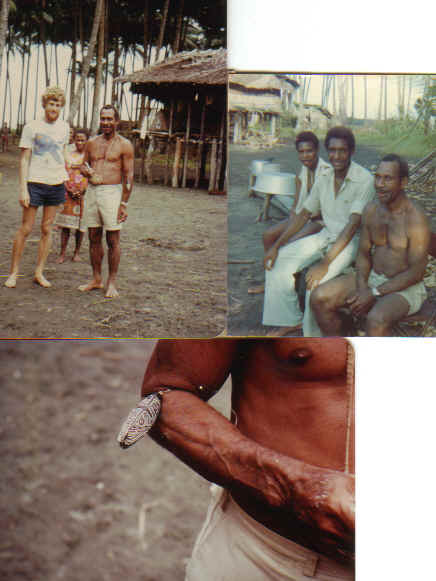 He has a Marupai on each elbow, his Bone Arrow in his hand, and his bag of poisons around his neck (see Oceania paper). 2. Hearo (right) with Kopi Heroe (centre). 4. Marupai (close-up), showing the mouth to the bottom left. 5. Close up of bone-arrow, poison bag and marupai. 1. Talair flight landing at Kainteba - an airstrip so steep that to reach the top, pilots have to open full throttle on landing. 2. Fr. John Flynn with Hauabango villagers (Kamea). 3. Catholic Church Kanabea, supported by the Melbourne Overseas Mission. 1 & 2 - Kamea at Catholic Church Bema. 3. Tree fern on Bema-Haubango track, +1,000 metres (4,000 feet). 4. Kamea women at Bema making grass skirts. The children's distended bellies is normally due to parasites and a diet comprising of a very high daily volume of kaukau (sweet potato). 1. 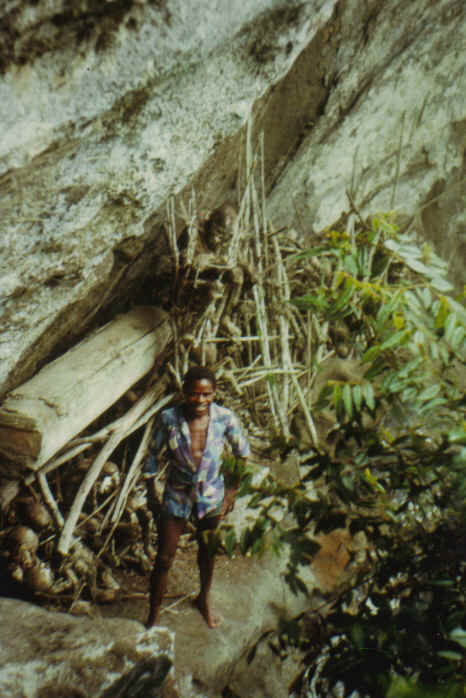 The Place of the Dead near the top of the Bema-Haubango track at about 1,500 metres (5,000 feet), being shown by Lawrence. 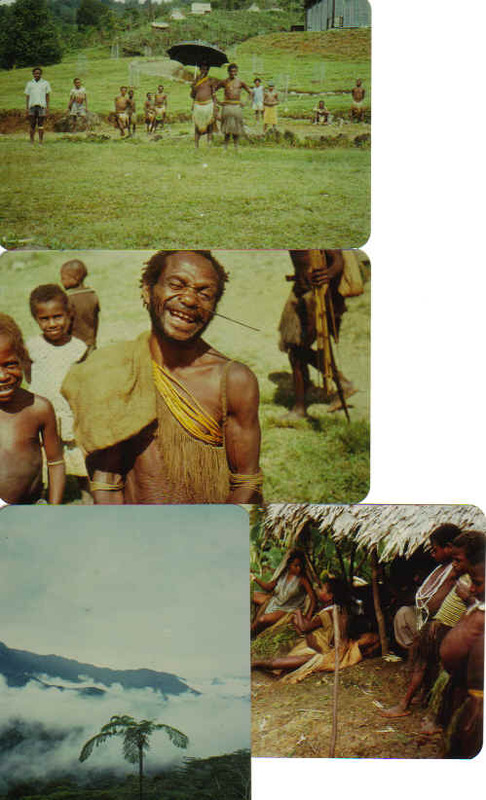 The Kamea and related "Kukukuku" people formerly smoked the bodies of their dead, and placed them on high rocky ledges overlooking the valleys supported by sticks. In this picture, very poor because of bad lighting conditions, one intact figure can be seen in a sitting posture. The skin was still on the bones. Other, presumably older skeletons, are jumbled together underneath - a number showing signs of violent death in the tribal wars that previously marked the area. The wooden coffin, we were told, indicates the commencement of missionary influence (early 1960's if I remember right), whereafter the Kamea adopted the Western practice of burial. This was made more easy by the introduction of iron tools for digging - arguably a pity, because the view would then be less good. When I was there in late 1979 I had no problem finding a local man (the priest's housekeeper's father) who was able to bind a stone axehead to a wooden shaft for me. The Kamea's indigenous eschatology, or what I was able to ascertain about it, seemed very minimalist - see Journal of the Society for Psychical Research paper. 1. Bema-Kainteba valley in the Kamea area of Gulf Province. Here 3-phase wiring is being installed above the old diesel generator power house ready for the new hydro scheme. Up until this point it had been necessary for all fuel to be flown in, as there was no road. The project to power the school, hospital, church and village by hydro had been started by the French priest, Fr. Bessant. He was killed in a crash on the airstrip that he had built himself. No further work was done on the hydro for 7 years until the end of 1979, when the Bishop asked me to try and get it started. With considerable help from people like the VSO field officer and passing priests (who were often brilliantly skilled in DIY), as well as great encouragement and resources from the parish priest, Fr. Patrick Harvey of Melbourne, it burst into life after 3 month's work. 2. The hydro power house - Most of the mechanical work and much of the hydraulic side had already been completed. My role was to supervise and train the guys in completing work on the raceway and installing the alternator, including switching and monitoring gear and site wiring. It was a fantastic opportunity for learning on the job. We required 3 charter plane loads of equipment to get it all going. 3. The 1920's Francis turbine was brought over by Fr Jean Besson from an old sawmill in the French Alps. It was ideal for our high water volume but relatively low (10 metre) head. 5. It was too much hassle and expense to wire the whole site for 3-phase, but as there was more than enough power I just dumped two of the phases into heat sinks - 44 gallon water-filled oildrums equipped with heaters - and ran the rest of the site on a single phase. The heaters provided the hospital with hot water and were used by the patients as a warm place to sit beside at night. When I went back in 1989, one had been nicked by Pat Harvey for heating his shower! That was the kind of concern for home comforts that made working with Pat such fun, and caused me to engrave in the header-pool concrete the dedication, "St Pat's Hydro."